← 2015 MLB Playoff Predictions: Cubs End Curse! My playoff predictions proved to be more accurate than my regular season predictions. Toronto and Kansas City both won their respective series in five, although the Blue Jays did it the hard way. I will also point out that Ben Zobrist had himself a pretty good series as well. I had thought perhaps the Cubs/Cardinals games would feature some dust ups, but instead that came between the Jays and Texas Rangers. Don’t get me started on Jose Bautista’s bat heave–actually I already started and you can read my response to his epic fit of obnoxiousness here. We now have the two brattiest teams in baseball facing each other. I’ll still go with Toronto as they seem to be clicking on all cylinders despite the mysterious handling of David Price. The Cubs took care of business in four games rather than the five I predicted and I still like their chances against the Mets, who took the Dodgers in four. I had picked the Dodgers in four. New York has deep pitching, however, and a very hot player in former Luray Wrangler, Daniel Murphy, so it should be a classic battle. One thing I noticed about the Dodgers after watching this series: They’re not very good. Justin Turner is a very good utility player who appears to extract the most from his talent every day, but if the bearded red-head is your cleanup hitter? You’re not very good. That’s the playoff picture. 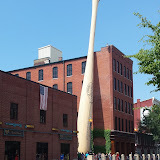 As for summer pictures, click on the photo below to take you to the photo album of the trip Al and I took to the Louisville Slugger Bat Factory and Indiana this summer. There are some great shots in there if I do say so myself and I’d like to see Jose Bautista try to heave this bat! This entry was posted in Baseball Books, Baseball in General and tagged Bautista's bat flip, Chicago Cubs, Hillerich & Bradsby Factory and Museum, Jose Bautista, Kansas City Royals, Los Angeles Dodgers, Louisville KY, New York Mets, Texas Rangers, Toronto Blue Jays. Bookmark the permalink. (Just a note about the Mets & Dodgers Series) It went 5 games. Right on the money with Blue Jays & Royals! Hopefully they will provide milk & cookies, so maybe they will play nice! Yeah, I had the Dodgers in four; and I doubt Toronto and Kansas City play nice! Your right, Bautista has already showed his true colors. Question: What do Bautista & Jeremy (The guy who commented on Seamshead have in common?) Answer: They are both un-professional. Jeremy certainly had a strong reaction, did he not?! Thanks for coming to my rescue, Don. I have always had your back buddy, that’s the kind of guy you are. No, that’s the kind of guy YOU are, and I’m glad of it!